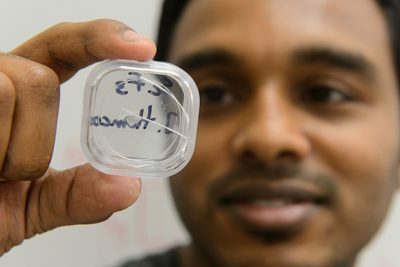 Jason Hancock, Assistant Professor in Physics, with graduate students, Erin Curry and Sahan Handunkanda, have been investigating a substance that shrinks when it warms. Although thermal expansion, and the cracking and warping that often result, are an everyday occurrence – in buildings, bridges, electronics, and almost anything else exposed to wide temperature swings – physicists have trouble explaining why solids behave that way. Research by Hancock and his colleagues into scandium trifluoride, a material that has negative thermal expansion, recently published in Physical Review B, may lead to a better understanding of why materials change volume with temperature at all, with potential applications such as more durable electronics. For the complete article in UConn Today that explains their findings, see “Caution: Shrinks When Warm” . Researchers have made an experimental breakthrough in explaining a rare property of an exotic magnetic material, potentially opening a path to a host of new technologies. From information storage to magnetic refrigeration, many of tomorrow’s most promising innovations rely on sophisticated magnetic materials, and this discovery opens the door to harnessing the physics that governs those materials. The work, led by University of Connecticut professor Jason Hancock, and Ignace Jarrige of the Brookhaven National Laboratory, marks a major advance in the search for practical materials that will enable several types of next-generation technology. A paper describing the team’s results is published this week in the journal Physical Review Letters. 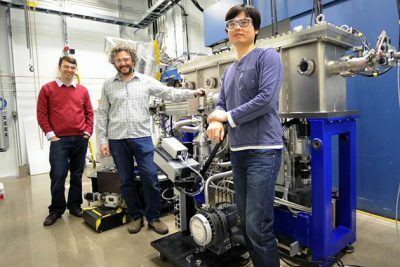 The full text of this article can be found on the UConn Today website at “Physicists Solve Low-Temperature Magnetic Mystery”.